This article will focus on ventricular fibrillation, pulseless electrical activity and sudden cardiac arrest. These arrythmias lead to death if cardiopulmonary resuscitation is not started immediately. Ventricular fibrillation means that the ventricles do not produce any meaningful contractions, they merely fibrillate. Absence of contractions causes syncope and circulatory collapse. The patient dies if the rhythm is not restored. The mechanisms in ventricular fibrillation are, as in atrial fibrillation, existence of multiple re-entry circuits which cause chaotic ventricular depolarization. The prognosis is very poor, with the majority of patients dying. Approximately 80% of individuals who suffer a sudden cardiac arrest have ventricular fibrillation prior to the cardiac arrest. Most of these have atherosclerotic heart disease (coronary artery disease) as the underlying cause. Other common causes are cardiomyopathy (hypertrophic or dilated), arrhythmogenic right ventricular cardiomyopathy, Brugada syndrome, early repolarization. Electrolyte disorders, acidosis, hypoxemia and ischemia all aggravate the risk of developing ventricular fibrillation, in any situation. The ECG shows irregular waves with varying morphology and amplitude. No P-wave, QRS complex or T-wave can be seen. This is pathognomonic (unique) to ventricular fibrillation and must not be confused with any other arrhythmia. Figure 1. Ventricular fibrillation and asystole. Figure 2. 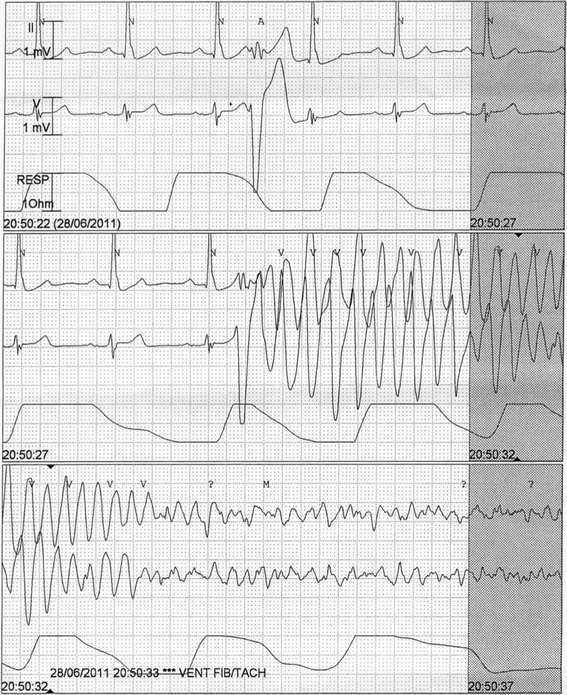 ECG showing ventricular tachycardia degenerating into ventricular fibrillation. By Bagnall et al: BMC Medical Genetics 15 (2014): 99. Ventricular fibrillation is treated according to the resuscitation algorithm. Cardiac arrest ensue when ventricular contractions cease or are meaningless. This immediately leads to syncope and soon death, unless resuscitation is attempted. Sudden cardiac death is defined as an unexpected death due to cardiac causes that occurs within 1 hour of symptom onset. The person may or may not have known cardiac disease. Moreover, the time limit (1 hour) is not absolute. Sudden cardiac death causes 7 million deaths annually worldwide. The most common cause of sudden cardiac death is acute or chronic coronary artery disease (ischemic heart disease). Cardiomyopathies (dilated or hypertrophic), valvular disease, genetic mutations (LQTS, Brugada syndrome, early repolarization) etc, are much less common than ischemic heart disease. The death mechanism is usually the same regardless of the underlying disease: electrical instability triggers ventricular tachycardia which degenerates into ventricular fibrillation which leads to asystole. The latter, asystole, means that there is no electrical activity in the heart and the ECG shows a flat line (Figure 1). Sudden cardiac death due to bradycardia or pulseless electrical activity are much less common. 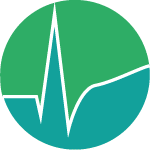 Acute or chronic ischemic heart disease cause 80% of all sudden cardiac deaths – Ventricular arrhythmias may arise during acute ischemia as well as in chronic ischemia. 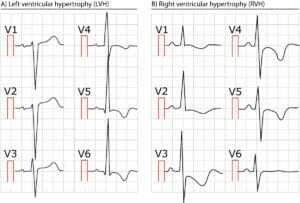 Dilated or hypertrophic cardiomyopathy – Causes 10-15 % of all cases. Less common causes (5% of all cases) – Atrial fibrillation with pre-excitation, arrhythmogeniv right ventricular cardiomyopathy (ARVC), long QT syndrome (LQTS), Brugada syndrome, aortic stenosis, amyloidosis, third-degree AV-block III without escape rhythm. Metabolic derangements, electrolyte disorders and exogenous substances, ischemia etc may precipitate ventricular arrhythmias in all these patient groups. As seen in Figure 1, asystole occurs when there is no electrical activity in the heart. The heart is completely still during asystole; i.e there are no atrial or ventricular depolarizations. Brady-asystole is defined as asystole interrupted by occasional QRS complexes, but no rhythm capable of producing a noteworthy cardiac output. Asystole and brady-asystole are treated according to the resuscitation algorithm. 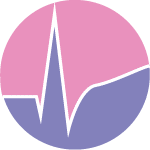 Pulseless electrical activity is a term applied to any rhythm which is not accompanied by a detectable pulse. It may display complete P, QRS and T waveforms but no pulse is palpable. This means that the hearts electrical activity has been dissociated from mechanical contractions, which is why the synonym electromechanical dissociation is often used. The following conditions may cause pulseless electrical activity: hypovolemia, hypoxia, cardiac tamponade, pressure pneumothorax, hypothermia, massive pulmonary embolism, drug overdose, massive myocardial infarction. The most common of these is myocardial infarction. Massive myocardial infarctions may leave too little viable myocardium to generate stroke volumes that are palpable. Pulseless electrical activity is treated according to the resuscitation algorithm.